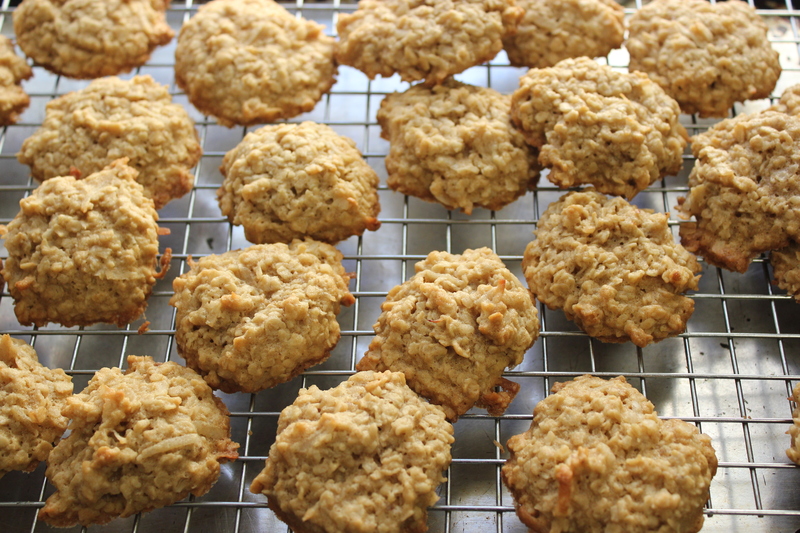 Until recently, not many people ate oats, let alone oatmeal cookies. The grain was considered animal fodder, except in parts of northern Europe and the British Isles — particularly Scotland, where oat porridge and oat cakes were staples for many centuries. Oats were rarely eaten by North Americans until the late 19th century. Some Scottish and German immigrants used the grain in porridge, puddings, and Scottish-style oat cakes, which contain little or no fat or sugar. 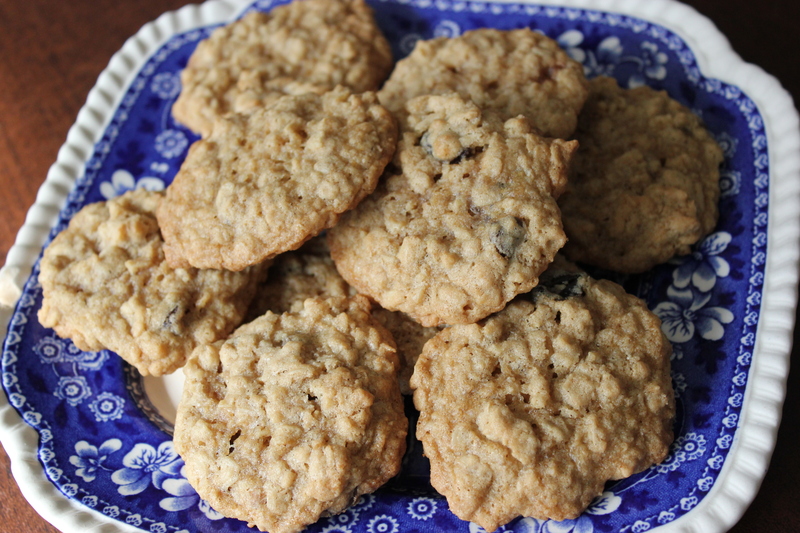 But as far as I can tell, oats did not find their way into early American cookie recipes — at least not published ones. Then in 1877, the process of steel-cutting oats was invented at the Quaker Mill in Ohio, making hulled oats (“groats”) more uniform and less floury than the stone-milled variety. The same mill then developed a roller to flatten groats, creating the modern-day rolled oat, which cooks more quickly. The Quaker Mill was eventually combined with three others to form the Quaker Oats Company, in 1901. This company made the wise decision to put recipes for porridge and cookies on its boxes. The early boxes were square — the round version didn’t appear until 1915. The Quaker Oats recipes circulated widely, and oatmeal cookies were soon common in households throughout the United States. There were some non-Quaker Oats recipes out there — including one in The 1896 Boston Cooking-School Cook Book that was sort of a cross between an oat cake and a cookie — but Quaker Oats’s promotional efforts seem to have been the driving force behind the oatmeal cookie craze. A recipe for sweet cookies first appeared on Quaker Oats boxes sometime between 1910 and 1917. “Famous Oatmeal Cookies” were featured in 1922, the year that quick-cooking one-minute oats were introduced. This recipe called for Crisco vegetable shortening. I doubted whether this could really be an old recipe but was surprised to learn that Crisco was invented in 1911 (and incidentally stands for “crystallized cottonseed oil”). “Oats Macaroons,” containing shredded coconut, went on the Quaker Oats box in 1930. According to writer Diane Stoneback, these cookies were promoted by the company as “little luxuries” during the Great Depression. “Crisp Oatmeal Cookies,” which were rolled, chilled, and sliced, premiered in 1935, followed by “Mary Alden Oatmeal Cookies,” with more eggs and sugar, as well as raisins, in 1943. Some of these early recipes were tweaked in later decades, for better or worse, and more recent recipes have added ingredients such as peanut butter and chocolate chips. I made two of the older recipes, Oats Macaroons and Famous Oatmeal Cookies, and am listing recipes for both below. I preferred the macaroons because they contain butter, not vegetable shortening; the shredded coconut also adds a nice flavor and texture. My husband and daughter liked both, but particularly the Famous Oatmeal Cookies, which were slightly crisper (see picture at top). The macaroons are pictured below. 1. Preheat oven to 350°F. Lightly grease several baking sheets. 2. In a large bowl, beat butter and sugar until creamy. Beat eggs briefly, then add eggs and almond extract to the butter mixture. Beat well. 3. Stir together the flour, baking soda, and salt, then add to the butter mixture, blending thoroughly. Add oats and coconut, and mix well. 4. Drop dough by rounded teaspoonfuls onto baking sheets. Bake 8 minutes or until light golden brown. Cool two minutes on sheets, then remove to a wire rack and cool completely. Store tightly covered. Yields about 4 dozen cookies. 1. Preheat oven to 375°F. In a large bowl, beat brown sugar, shortening, and white sugar until creamy. Add water, egg and vanilla, and beat well. 2. Stir together oats, flour, salt, and baking soda. Add to the butter mixture and blend well. 3. Drop dough by rounded teaspoonfuls onto ungreased baking sheets. Bake 9 to 11 minutes until the cookies’ edges are golden brown. Remove to wire rack; cool completely. Store tightly covered. Makes about five dozen. Note: The original recipe for Famous Oatmeal Cookies did not contain raisins, nuts, or chocolate chips, but a cup or so of any of these can be added in as a last step before baking. This entry was posted in cookies, dessert and tagged food history, macaroons, Mary Alden, oat cakes, oatmeal, oatmeal cookies, oats, Quaker Oats, rolled oats by revolutionarypie. Bookmark the permalink. Thanks, Jama. 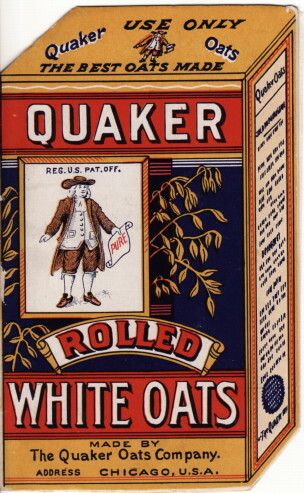 It’s hard to believe oats used to be so unpopular, right? I will have to try both of these recipes! Where would I be without a daily oatmeal fix? If you make the Famous ones with butter, please let me know how they turn out. Learn something new every day! I really like the idea of those oat macaroons. It makes sense that they were one of Quaker Oats’s earliest recipes, since regular macaroons were so common back then — they seem to have fallen out of favor in recent times. I am really looking forward to trying these. As an American living in the UK, I really miss proper oatmeal cookies. When I’ve tried to make them I’ve made the mistake of using Porridge Oats (which disintegrate into flour) rather than rolled oats. Actually, I was inspired to write about oatmeal cookies after a visit to London this summer, where I stuffed myself with oat flapjacks (and Victorian spongecake, and a few other things). That got me wondering about the history behind all of it! I hear ya! I have so many blogging projects on the go too and sometimes wonder what’s the point! But you’ve reminded me to pursue three Oatmeal Cookie ideas and if I get to them I will link back to you. Thanks for a well-researched look at what is now a bakery staple. It’s interesting that Crisco was introduced around the same time as the cookie recipe on the Quaker Oats box. Pie baking hasn’t been the same since Crisco came along – it’s in so many pie crusts – but it infiltrated cookies, too. Oh, please share the oatmeal/molasses cookie recipe. I love all things molasses. You can e-mail it to me or give me a reference, if it is not possible to put in on your site. Over at Ancestors in Aprons, I’m readying an oat-cake recipe from a Gaelic cookbook from Nova Scotia, and I’ll definitely link your very informative article. Hi there. The recipe I made was from the Raleigh Tavern Bakery in Colonial Williamsburg — I’ll email you a link. (BTW, it contains shortening so can’t really date from Williamsburg times). I look forward to seeing your Gaelic recipe!